Learn how-to unlock all of the characters in Blackout with this guide! Call of Duty 4: Black Ops is out now and people are having questions on how-to unlock characters in Blackout. Our guide on obtaining all of these characters will walk you step-by-step through the process! Characters in Blackout are essentially what you would call "skins" in this game. They don't offer any real benefit other than looking different in the game. However, if you are a season Call of Duty fan you'll find a ton of characters from past games that might resonate with you. This list is currently a work in-progress, but we'll be updating it as fast as possible! These are the characters you can unlock by gaining merit/experience or by purchasing the Black Ops Pass. These are all unlocked by reaching higher Echelon levels. This is your basic experience system in Blackout. Each time you get a kill, high placement, win, or complete a challenge you will gain merits. These merits are essentially experience, and the more you gain the faster you will level up. Every 20 levels you will unlock one of these: Ranger 20, Frogman 40, Airborne 60, Seal 80, and the odd one is Battle Hardened which is 80 with a star. We're not quite sure what the star means yet, but we'll let you know when we find out. Kills: 10 merits per kill. Placement: Top 5 gives you 50 merits. Win: A win will give you 100 merits. These are characters you will need to find items for in the game and complete specific tasks to complete. All of these missions require that you keep the item in your inventory until you complete it. You do NOT have to win every match to finish all of these, most of them just say "complete the match" and that just means you either are eliminated or you win the game. For this one, you are looking to find Wood's Bandanna. You can find this at the location listed below on the map, the bandanna will be on top of one of the brown boxes. You should grab a helicopter and head to this location. Not only does it make it really easy to see the bandanna, but you'll need the helicopter for part of the mission. The missions objectives are a bit confusing because they are quotes from the character. If you want to unlock Mason, you will need to find the Stained White T-Shirt. It can be found by looting supply drops. You will actually need to first unlock Reznov before you even attempt this one, because that's one of the mission parameters. To wake the Sleeper Agent you need to head to array and the big middle Satellite area, and look for the panel with the green light as shown below. Interact with the panel, you'll start to hear a unique noise going off which signifies that you've done it. Be sure to check the item to make sure you got credit for it. Finish Match with T-Shirt in Inventory. You'll need to find a Locket to start this mission, it can be found in supply drops. The mission is pretty self-explanatory, but it's not going to be easy. Getting the kill with a shotgun shouldn't be too hard, but having to then get a kill with a melee attack is where things go off the rails. Try to find the Brawler perk and then sneak up on someone and punch their lights out! You might want to try just finishing a downed enemy with a melee hit and see if that counts for the mission. Finish Match with Locket in Inventory. To unlock Reznov you will need to find the Ushanka Hat. You can find the hat at the bottom of the fountain in the middle of the roundabout at Estates. The mission says "extreme range" as one of the things you need to accomplish, this apparently means you need to kill someone at 200 meters away from you. You'll also need to place in the top 3, but this might be different depending on which mode you are playing in (solos, duos, or quads). Kill an Enemy at extreme range. Place in the Top 3. Finish Match with Ushanka Hat in Inventory. This is probably going to be the easiest one because you'll find these items a lot when you get kills. When you kill an enemy and break their armor they will drop a broken armor plate in their inventory. Grab three of these in a single match and hold onto them. If you have three in your inventory when you win or are eliminated, you will unlock Ajax. Scavenge 3 broken armor plates from enemies and complete the match. To unlock Battery, you are going to need to find the War Machine weapon. Yes, this is actually a usable gun, and you'll need to use it to complete the mission. You can find the gun in Supply Drops, the ones that are dropped out of planes. It might be better to do this in solo, because your kills will only count if you knock them and finish them if you play duos or squads. You are looking for Poker Chips to unlock Crash. You can likely only find these in med bags, but this is not confirmed. End the match with 15 Healing Items in inventory. Finish Match with Poker Chips in Inventory. To unlock Firebreak you will need to find a Burned Doll. You can find the doll in supply caches. Confirm Kill or Clean Up a downed player with fire. Find yourself a Molotov and throw it at your enemies! This will be way easier in duos or squads so you can just finish off a downed player. You are looking for Juneau's Tags to start this Character Mission. Kill 2 Enemies without taking damage from them. This used to be that you had to kill three Specialist characters in the game. It was really hard to do this because you had to get lucky in the people you killed, and hoped they were using Specialist characters. Now, they've changed to you just having to kill 2 enemies without taking damage from them. This is still kind of difficult, but it's much more doable than the previous version of the mission! To start the Prophet Character Mission you will need to find the Ocular Prosthetic. You can find this in Supply Drops or off fallen enemies. Finish Match with Ocular Proshetic in Inventory. This might be the hardest one, because not only do you have to win the game, you'll have to have those three perks active when you do! You are looking to find the item "I Ching Coins" which will give you the mission to unlock the Recon character. You'll need to find "Punching Mitts" to unlock Ruin. You can find these in set locations across the map: top of the crane at Construction Site, directly on top of the Lighthouse, in the rafters of the Turbine area, and on the rooftop of the Asylum. The rooftop of Asylum will be the easiest way to grab these, because it's pretty easy to land on top of the roof. Close quarter combat doesn't have to be right next to the person, but within the same room. To start the mission for Seraph, you will need to head to the location listed below in Firing Range. 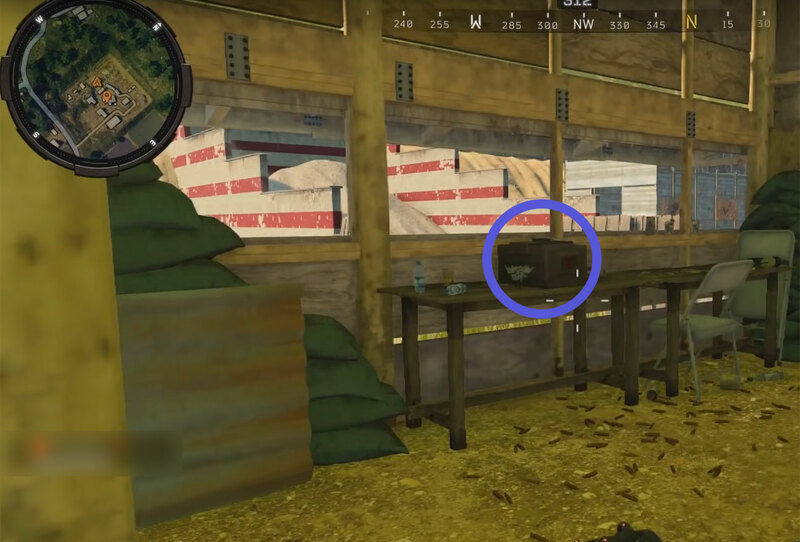 If you see the box that is circled above, look out the window directly in front of it and shoot the grey target with a pistol. That will open the box and give you the Annihilator pistol. You will need to use this weapon, get a kill with it, AND place in the top 5 to unlock Seraph. This might be bugged currently, it appears people are getting credit in solos for reaching top 15. However, duos is where it appears you'll need to get into the top 5. Kill 1 Enemy with the Annihilator. Place in the Top 5. Finish Match with Annihilator in Inventory. You'll need to find the item "Note from Torque" which appears to be found in supply drops (boxes that float down from the sky). Finish Match with Note from Torque in Inventory. You will need to find the Mug Shot item to start the Character Mission. A reliable way to find the Mug Shot item is to head to the graveyard that is south of Asylum and kill the Blightfather. You'll know the Blightfather is there if you see a red beam of light in the center of the area. This isn't a guaranteed drop, but it seems to be the most reliable way to find what you need. You can also check supply drops for this as well. Now, you are going to need to get a melee kill to actually unlock Bruno. This is going to be pretty difficult, and the best way to do it might be to find the Brawler perk, and wait until you can either sneak up on someone or get close enough where you can use it and then one shot the person. It's a lot easier said than done. Finish Match with Mug Shot in Inventory. To unlock Diego, you will need to find the Pulp Magazine. To find this, you will either want to kill the Blightfather or just slay out some zombies for the random drop. The challenge part of this is pretty easy, just get a kill with a headshot and you'll be good to go! Kill 1 Enemy with a Headshot. Finish Match with Pulp Magazine in Inventory. You will need the Racing Goggles & Scarf item to start off the Character Mission for Scarlett. Like all of these, you can kill the Blightfather to have these drop, but the easier way is to just kill Zombies and hope for them to drop. It is a random item drop from Zombies, so slay them out and hopefully you'll get one. The challenge portion of this isn't too difficult, but it's not easy either. The easiest way to do this is likely going to be grabbing a truck and just plowing someone over. The ATV is a bit too fast and is pretty hard to actually run someone over with. Finish Match with Racing Goggles & Scarf in Inventory. To unlock Shaw, you will need to find the Alchemical Set. This is another one you can find from killing the Blightfather, but you can also go to a zombies location and kill a round of them to unlock the mystery box. You can potentially find the Alchemical Set in the box, but it's not a guarantee. Check out our Blackout Zombies Location guide for more information on them. Now, you'll have to kill 2 enemies with a Wraith Fire or Acid Bomb. Upon hearing that, you are probably wondering: "what the hell are those?" Well, when you kill the Blightfather or open the mystery box that contains the set, you will find two Wraith Fire and Acid Bomb grenades. You will want to loot those, and then use them to get your kills. Wraith Fire is basically a zombified version of a Molotov, and an Acid Bomb is a zombified version of a Cluster Grenade. Kill 2 Enemies with either a Wraith Fire or Acid Bomb. Finish Match with Alchemical Set in Inventory. Don’t play blackout much but will definitely come back to thid when I do. Great list, but wish you could do more stuff on regular multiplayer. The unlock objectives for Seraph now correctly state that you just have to place top 15. I believe the duos number is actually top 4 as my friend got her in a duos game with me a couple days ago. This is not 100% confirmed as I can’t quite remember. Maybe if you can research that or even just go into a duos game and get the annihilater just to look, they might have changed it in an update. The placement you have to get for Torque is actually just top 30 (solos game of course). I’m not sure on the duos and quads placement. For Crash, in solos the placement is just top 15. Again, not sure on the duos and quads placement. I think duos might be top 8, but I’m not 100% sure. Maybe you can research these things (regarding the placements depending on the mode) as a lot of them differ. Preferably yourself as a lot of videos/articles are incorrect in these small details. Also an important note. Since tomorrow is a Tuesday, it’s likely they’ll make the last 4 zombies characters avaliable so keep a look out! I’ll comment again should I see any more mistakes. Also, I hope I’m not bothering you with all these comments. I love Blackout and just want this guide to be 100% reliable. I know you work very hard to keep the Fortnite guides up to date, so I just try to keep this one updated for you as well. You aren’t bothering me, I appreciate the comments! Sorry, it sometimes takes me a bit to respond. I’ll try to look into the numbers for those characters. Also, with today’s update they just made Woods, Mason, Reznov, and Menendez avalible to unlock so keep a look out for those unlock methods. Also in an important note, they’ve changed the unlock method for Nomad. Now you just have to kill two enemies without taking damage from them, and finish with the tags in your inventory. You can check all this information out in the recent patch notes. Hey, just wanted to let you know that for Diego, the numer of enemies that you need to headshot does NOT increase with the mode. I unlocked him in a duos game and just needed one headshot. Perhaps this is different for quads but I kinda doubt it. It’s just a rumor that got spread around I believe. Also, for Bruno, his mugshot can also be found in a supply drop. Just seems like an easier way to obtain it over the Blightfather. Thanks, I made the changes! Does downing a teammate count as an enemy? All the Multiplayer characters as well as the Chaos crew from zombies are now avaliable to unlock. Thanks, I added them now! Just found the I Ching Coins in a supply crate, and place 46th without callapse damage. Unlocked Recon. I found the Poker Chips in a supply drop and also it might be helpful to add you can find any challenge items off of dead teammates or opponents. Just a little heads up. Scarlett is spelled with two T’s, not one.